Great post! I loved these patterns! 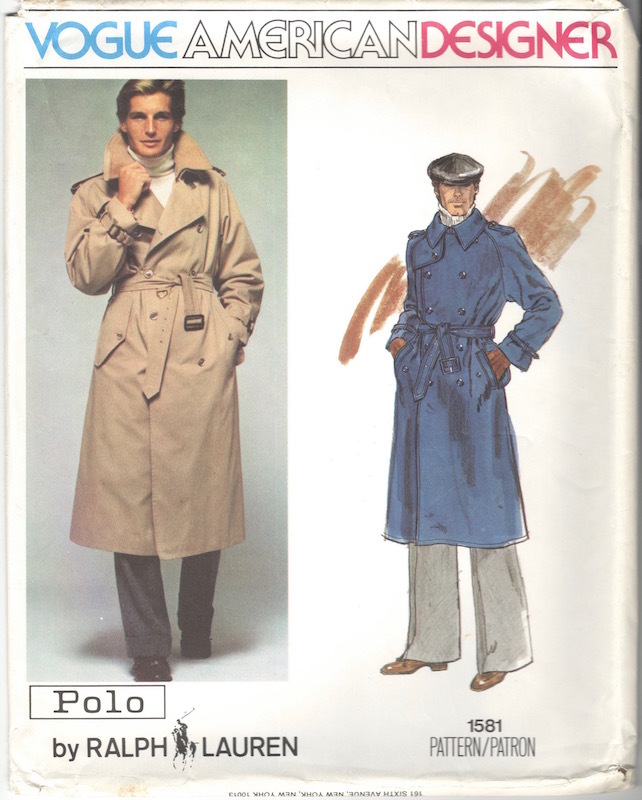 I’ve got most of the Vogue mens’ designer patterns, and I’ve used some with mixed results – mostly due to choice of fabric more than anything else, but I’ve got much better at matching fabrics to patterns over the last few years. I’m lucky that I only need to make minor alterations to mens patterns for myself so instead of doing a test in calico I usually either compare the pattern measurements to clothes I already have that fit well and adjust the pattern accordingly, or I just make a pattern up and then perfect the fit before making it up the second time around. 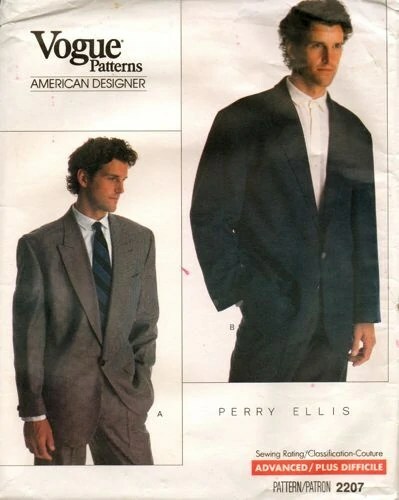 I’ve used the Perry Ellis shirt pattern from the late ’80s twice. I like the shoulder pleat detail (a Perry Ellis signature detail according to the recently released book on the designer) but because of the loose and box-y ’80s cut the shirt looks best when made out of a fabric with a soft drape (such as a loose twill weave), and not a crisp/stiff drape unless the shirt is to be worn tucked-in. 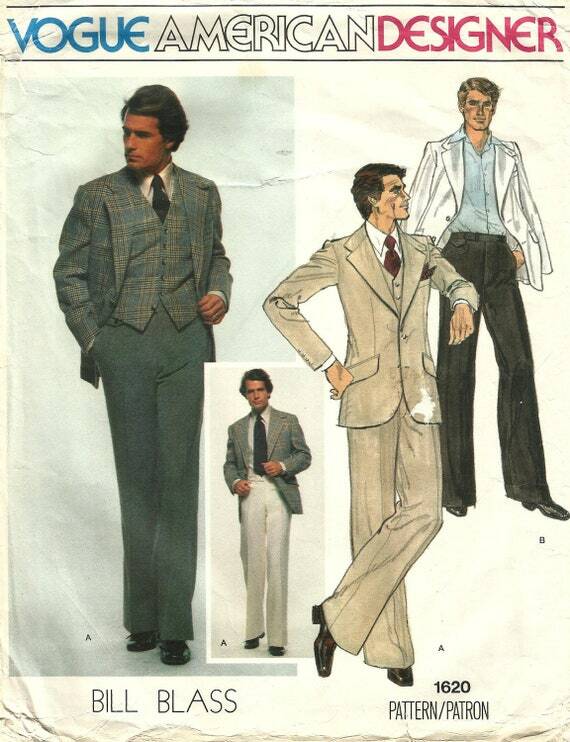 I’ve used the Calvin Klein pants pattern twice (I made one each of styles A and B), a Calvin Klein jacket pattern twice (one single breasted and one double breasted) a Calvin Klein shirt pattern once, and a Bill Blass waistcoat pattern once. 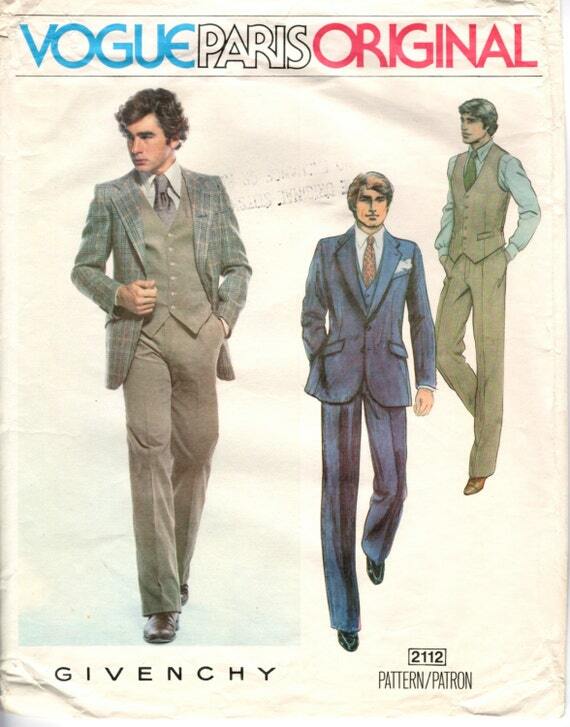 I didn’t like the Bill Blass waistcoat pattern because the armholes were too cut-away for my liking, but the Calvin Klein patterns were great. 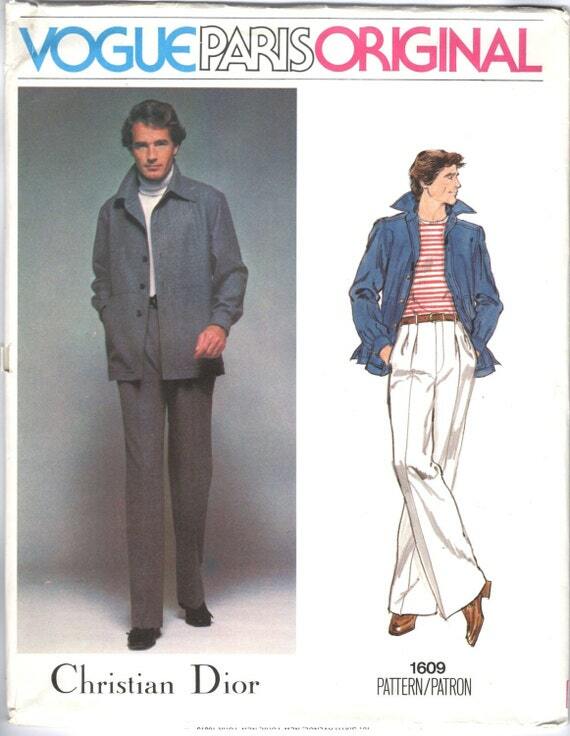 I have one of the Yves Saint Laurent patterns coming in the mail (the one pictured above, on the right – with the jacket with raglan sleeves) and once I find an appropriate fabric I’ll be making it up. Apart from any sense of glamour attached to designer patterns (which is mostly, if not wholly, in the mind of the sewer!) they often have the most interesting details and shapes that makes them stand out from the regular patterns. 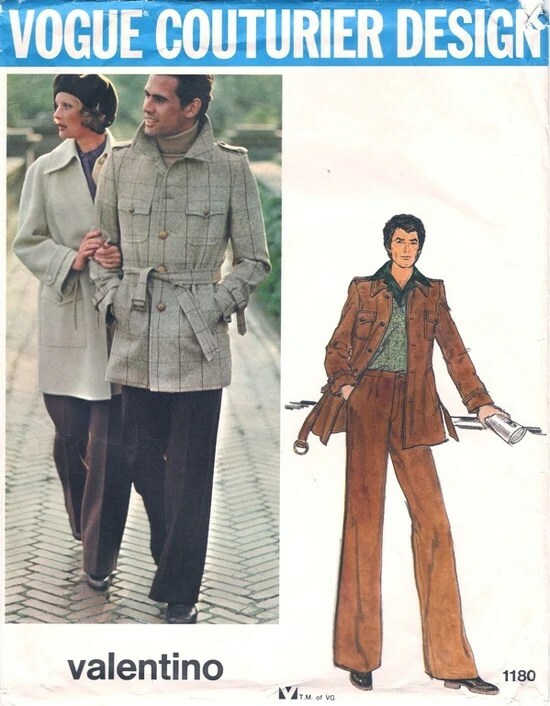 Also, with vintage designer patterns, there’s a definite history attached to the design. Regular patterns work out just as good, too, but for me there’s just that little something extra that makes a designer pattern that much more exciting to sew! Kudos to Dustin! It’s great to hear from a man like him. Even now, with tailoring supplies and fabrics available on the internet, fabric choice has so much to do with feeling the hand and the drape of the material that I’d hesitate before buying high-quality wool blends without touching them. Perhaps many home stitchers got discouraged after one try at a man’s pattern. A ‘designer’ man’s suit that looked home-made would be a worse choice than a less expensive store-bought suit, in most cases. 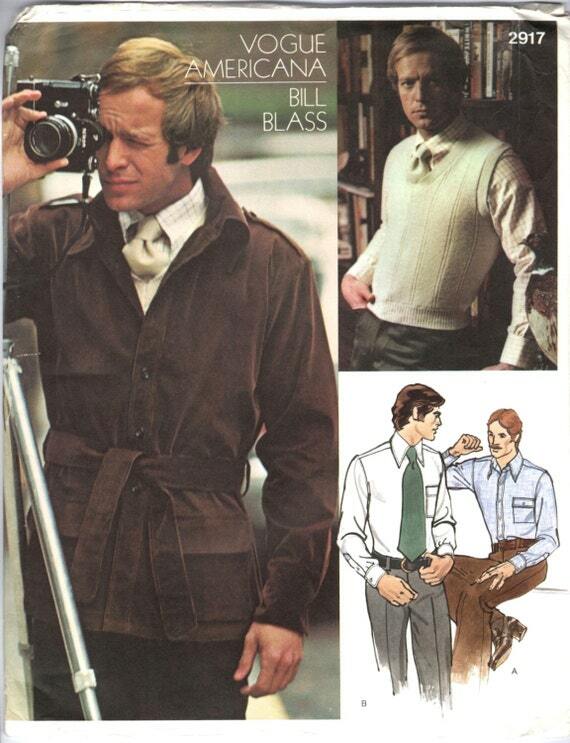 I wasn’t really aware that so many designer Menswear patterns existed. I am quite intrigued to try them. Obviously the economics don’t work these days, which is a great shame, as there are some really wonderful menswear designers around.